What in vivo models of PD have Revealed about Pathogenesis and treatment. Converging lines of evidence from toxin-induced and genetic models have continued to further our understanding of the pathological processes underlying PD and lend themselves as useful systems for the examination of therapeutic interventions. Models of PD are useful tools in evaluating potential neuroprotective therapies providing the ability to target any differences in motor activities and determine whether a drug differentially affects a specific motor behavior. 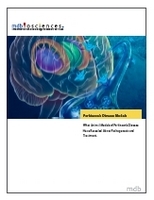 Whitepaper: What in vivo models of PD have revealed about pathogenesis and treatment. Though it is clear that much progress has been made over the past 20 years in understanding the etiology, pathology, and genetics of PD, considerable work is still needed to produce more-effective therapies and treatments. MD Biosciences, a Preclinical Contract Research Organization (CRO), offers in vivo models for the study of Parkinson's Disease (PD). The 6-OHDA and acute MPTP models for PD have been well characterized with the underlying mechanisms of toxicity well understood. Both models are useful tools in evaluating potential neuroprotective therapies providing the ability to target any differences in motor activities and determine whether a drug differentially affects a specific motor behavior. Parkinson's Disease (PD) is typically an adult-onset progressive neurodegenerative movement disorder that affects millions of people worldwide. Pathologically, PD is characterized by the profound and specific loss of dopaminergic (DAergic) neurons in the substantia nigra pars compacta (SNpc) of the midbrain. Other areas interconnected with the SNpc, the caudate and putamen, collectively known as the striatum, also show remarkable loss of their projection fibers. In accordance with insult to brain regions involved in controlling coordinated movements, the cardinal symptoms of PD include bradykinesia, resting tremor, rigidity, and postural instability. Due to its complex pathology, however, no disease model has yet to faithfully replicate all aspects of human PD. Converging lines of evidence from toxin-induced and genetic models have continued to further our understanding of the pathological processes underlying PD and lend themselves as useful systems for the examination of therapeutic interventions. MD Biosciences is a Preclinical Contract Research Organization (CRO) providing services and products for biotech/pharmaceutical, medical device and animal health and companies engaged in inflammations & neurology research. With specialized laboratories located in Minnesota, Glasgow, and Israel, our panel of internationally recognized experts provides in-depth expertise and technologies to overcome challenges and provide total solutions to the drug discovery market. The information in this press release should be considered accurate only as of the date of the release. MD Biosciences has no intention of updating and specifically disclaims any duty to update the information in these press releases.